Ecclesiastes records the reflections of a deep thinker who works through an existential crisis and concludes meaning can only be found in God. While many people find this book depressing, I think taken as a whole it offers a remarkably hopeful perspective that can actually help us work through the sort of questions that were weighing on the author (most likely Solomon’s) mind. When I recently went back to studying Ecclesiastes, I had this grand vision that I would write a post about the entire book (similar to “Crash Course in Romans”) in less than a week and post it today. I’m currently laughing at myself for thinking that was an attainable goal. Instead, we’re just going to talk about a handful of verses in the middle of the book that have captured my attention, and save the Crash Course in Ecclesiastes for next week. Like Romans, Ecclesiastes is hard to understand if you take bits and pieces out of context, so before we get to the verses that I want to focus on today we need to take a quick look at what came before. He has also been questioning the meaning of life. If all the things that people pursue on earth are meaningless, then what is there for us? Several times he argues that there is “nothing better” for men than to rejoice in this physical life (Ecc. 2:24; 3:13, 22; 5:18). But that’s still not a satisfactory answer for him. He wants more, something to explain why we should keep trying and what’s the purpose in living. Up until this point, there has been a, “Let us eat and drink, for tomorrow we will die” theme running through Ecclesiastes (Is. 22:12-13). It seems that in Solomon’s mind at this time, death was the point at which hope falls apart. Sure you can enjoy this life, but it’s all emptiness because you still end up dead with no guarantee that you have anything to show for it. Now, though, Solomon suggests that we can use death to give us perspective on life. We must not forget that there is “a time to be born, and a time to die … a time to weep, and a time to laugh; a time to mourn, and a time to dance” (Ecc. 3:2, 4, WEB). There’s nothing wrong with feasting and laughter in its proper time, but staying there makes your heart foolish. Wise men keep their ends in mind. Death reminds us that we only have so much time to decide how we’re going to live our lives and what we’ll be remembered for. There is much value in a good life well-lived. Solomon has already concluded that “wisdom excels folly, as far as light excels darkness” (Ecc. 2:13, WEB). Here he reinforces that a good name — that is “a name for wisdom and goodness with those that are wise and good”(MHC on Ecc. 7:1-6) — is worth more than all the pleasures, wealth, etc. that he’d found so empty. if we have lived so as to merit a good name, the day of our death, which will put a period to our cares, and toils, and sorrows, and remove us to rest, and joy, and eternal satisfaction, is better than the day of our birth, which ushered us into a world of so much sin and trouble, vanity and vexation. We were born to uncertainty, but a good man does not die at uncertainty. (MHC on Ecc. 7:1-6). Death is not the end of the story, and for a man who considers his death and prepares for it (as Solomon goes on to say in the next verses, which we’ve already talked about) he has the opportunity to die with “a good name.” The word for “name” here is shem (H8034), and in the Hebrew concept it’s always connected with your reputation and character. Those who die having a good reputation and a good character are no longer subject to the evils of this present life and await their resurrection to a much better life in the future. That gives those of us left behind great hope even in the midst of sorrow (1 Thes. 4:13-14). The idea that the day of our death is better than the day of birth can be a hard one for people to come to grips with, even given the context we just talked about. We still grieve at death even though we know (as Solomon also concludes by the end of this book) that “the spirit returns to God who gave it” and that He will raise believers up in the last day (Ecc. 12:7; John 6:40). But maybe another verse in this section of Ecclesiastes can provide further explanation. The Hebrew word for “end” is achariyth (H319). To understand achariyth, we have to understand that the Hebrew concept of time is like “the view a man has when he is rowing a boat. He sees where he has been and backs into the future” (H.W. Wolff quoted in TWOT entry 68e). That’s why this word translated “end” can also mean last/latter days, after part, future, or reward. The end of a thing is better than the beginning because you will have arrived at the future goal and can now look back on where you’ve been with a better perspective. If you’d rather not think about death then the idea that the end is better than the beginning can be a depressing one because it forces you to confront something uncomfortable. 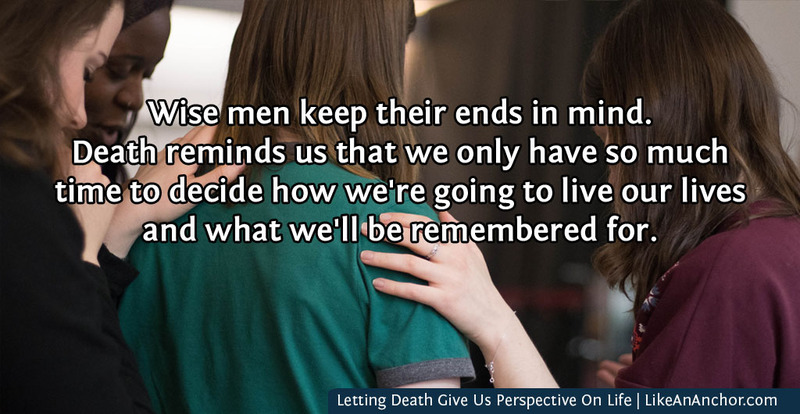 But ignoring the idea of our lives ending is foolish. 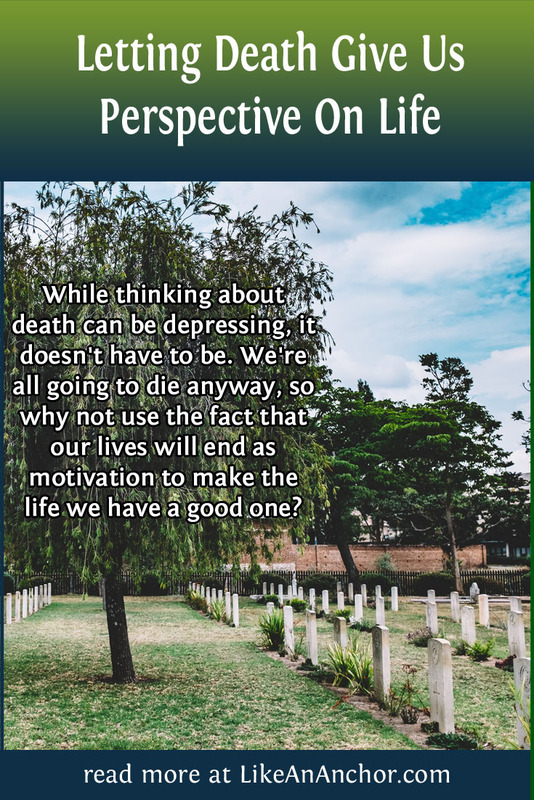 Everyone is going to die whether we think about it or not, so why not use the fact that our lives will end as motivation to make the life we have a good one?